2017 was to be my second time running London, but my first as a Sandhurst Jogger. My last one, in 2013, was my first ever marathon where I meticulously prepared and followed a training programme, running 4:27, which I was very happy with. 4 years, a few marathons later, my approach was less organised, to call my training programme haphazard would be putting it nicely, to call it shambolic would be more truthful. A wedding to plan and commuting into London for work, left me little time and energy for running. However, as busy as I was during the week, I made sure to stick with the long runs at the weekend, and managed to fit in 3 x 20 mile runs, including the epic canal run as well as a fairly hilly 20 mile event in the New Forest. 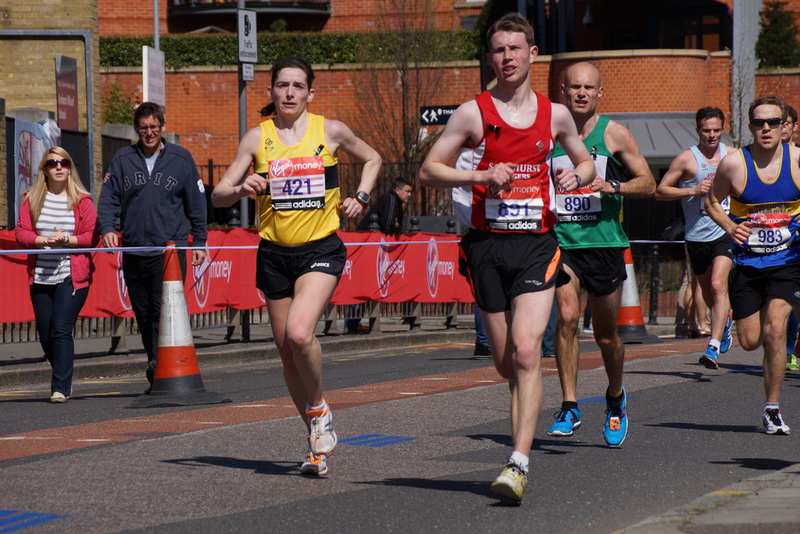 I was confident I would finish the London marathon, but I wanted more, this time I wanted to go faster. I thought it was pretty unlikely given how inconsistent my training had been, but knew if everything went to plan, then there was an outside possibility that I could beat that 4:27. The week leading up to the marathon was much busier than would have been ideal, with dentist appointments, wedding dress fittings, number collecting and various other things, so by the time sunday rolled round, I hadn’t had time to get nervous and was feeling remarkably relaxed. I mentioned to a few SJs how much nicer it was travelling as a group, the last time I had taken the train by myself and barely spoken to anyone, this time, team photos and camaraderie were the order of the day. Loo trips and bag drop offs were perfectly timed to leave me 15 mins to get into my starting pen and ready myself for the challenge ahead. I found myself near the 4:15 pacing team and gave myself a goal to stay ahead of them for at least the first half. A bit of last minute faffing with my garmin (changing from km to miles so I could keep track of my pace) and we were off. A speedy 13 mins to cross the start line – I’m sure it was more last time – and I was running. I tried my best not to get frustrated with other runners, but I found it difficult to settle into a pace as I was constantly dodging round people. I checked my watch after 6 miles and I was well ahead of my pace schedule so I relaxed and started to enjoy myself a bit more. By the time Tower Bridge rolled round I was grinning from ear to ear as I had made it to 12 miles and still not seen the 4:15 pacers go past. I’ve never ever been a PB chaser (I generally run trail marathons and ultras where they don’t matter!) and my motto has always been ‘finish lines, not finish times’ but…I reckon I’ve got a sub-4 in me with the right event and training. Watch this space.